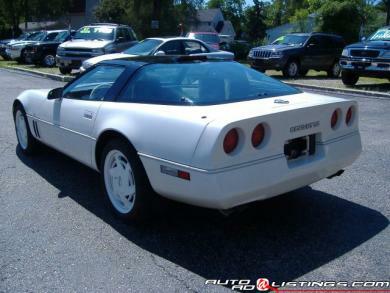 VERY CLEAN, NEW TIRES, BRAKES, AND YOU HAVE A WONDERFUL SPECIMEN OF THIS FINE ANNIVERSARY CELEBRATING THE 35TH OF THE CORVETTE. THIS CAR IS REGISTERED WITH THE NATIONAL CORVETTE REGISTRY FOR THE ANNIVERSARY EDITION AND IS #0195 OF 1500 PRODUCED. WHITE WHEELS, WHITE INTERIOR REALLY ADD A NICE TOUCH TO THIS ALREADY UNIQUE CAR. ONLY 75K MILES, WHERE ELSE DO YOU GO TO GET A CAR THIS LOW MILES WITH NO CHANCE OF SEEING SNOW - CALIFORNIA OWNED ALWAYS SAW SUN AND THE GARAGE. QUESTIONS, GET TO ME. I DON'T SUSPECT THIS WILL LAST LONG FOR IT HAS TO MOVE AND I AM A MOTIVATED SELLER.